Herbs and spices: one of the most under-appreciated components of eating naturally. Part of human history and culture for millennia. One of the greatest available resources for health, longevity, vitality and, most importantly for some, taste. 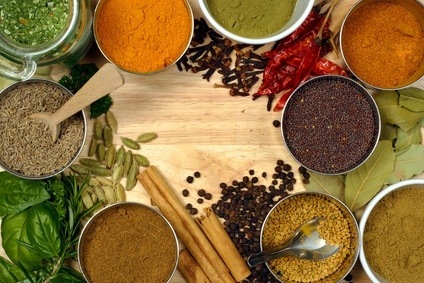 You can make food unbelievably tasty, enjoyable and nutritious by simply adding a few herbs and spices. A baked yam with cinnamon, nutmeg and ginger is a delicious, nutrient dense food that can rival anything store bought without the man made cascade of chemicals, additives and food products. Grass fed beef with some oregano, garlic, pepper and sea salt is unbelievably good and beats just about anything your local store could offer. Your imagination is the only limit with herbs and spices. Have fun. Experiment. Research. Look online for ideas. Look at your cultural traditional foods. Even find conventional foods, look at the ingredient list, pick out those spices and make your own version. I do this with guacamole. All the flavor with nothing extra. Tastes so good. Whether bought as a set or individually, one of the best investments you can make is in a good spice rack. The higher quality you can get the better. Fresh is best. If you can grow basil, cilantro, oregano, parsley, rosemary- awesome. If you need to buy it, no problem. Just get some spice in your life. Thanks for reading, have a spicy day!